If your manufacturing process requires one or more outsourced services you may struggle with the complexities of tracking materials and costs through the internal and external supply chain. Microsoft Dynamics GP offers a streamlined method to move materials, accumulate costs and update vendor records as needed. GP uses the Manufacturing Bill of Materials, Routing, Manufacturing Order and Purchase Order to capture the transactions with full integration to GL, Inventory and Accounts Payable. Fabrikam, Inc. produces telescopes that contain an anodized aluminum clamp. They machine the clamps in-house but use a local vendor who anodizes the clamps and returns them to Fabrikam’s main warehouse. Planning determines that it is time to replenish the anodized clamps. There is ample inventory of the raw, machined clamp so this will be a simple matter of sending the clamps out to the vendor for anodizing. Create a Manufacturing Order to make the item “Anodized Clamps”. The MO queries the Routing and finds that the work center is outsourced. The MO queries the Bill of Materials and puts the raw clamps on the picklist for consumption from the main warehouse into the outsourced work center. The presence of an outsourced work center allows the planner to easily arrange for the anodizing right from the MO Entry window. Create a linked Purchase Order for the anodizing service. Record the shipment of the raw clamps and print a Bill Of Lading referencing the parts, PO and MO for easy tracking. If the components are backflushed, nothing further needs to be done. When the anodized clamps return, enter a receipt for anodizing against the linked PO. This pulls the cost into WIP, updates the MO and creates an unvouchered receipt for invoicing. When the anodized clamps are ready to enter inventory, record a receipt against the MO. This pulls the cost of the raw clamps, the vendor charges and any other recorded costs out of WIP and into inventory for a fully costed made item. Update the Manufacturing WIP setup with the proper outsourcing cost bucket. Enter Routing sequences that point to the outsourced work centers. Include a Labor Code or Machine ID that represents the standard outsourced cost and quantity. 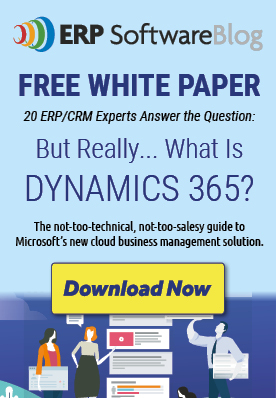 Beyond The Brochure – What Really Matters To Dynamics Users?